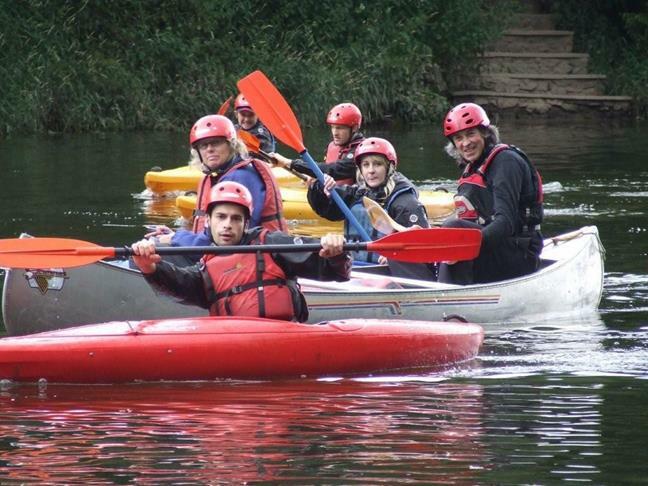 Canoeing and Kayaking - Adventure and excitement for all types of groups. 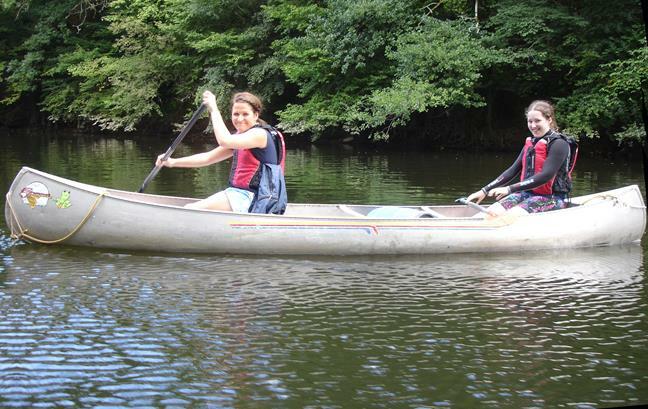 Canoe down the River Wye and Symonds Yat in an Area of Outstanding Natural Beauty. The water is novice friendly but it also has some rapids to liven things up. 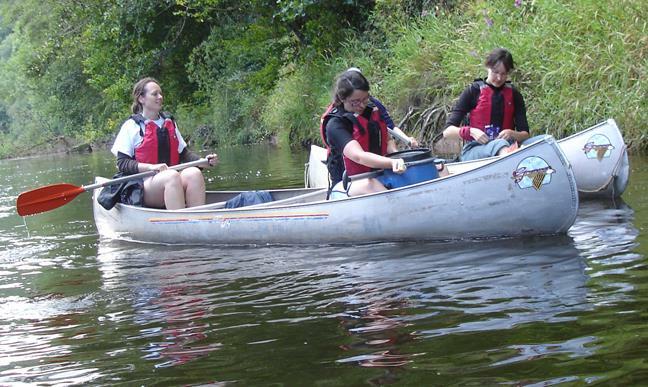 You will be canoeing in pairs in open canoes and there will be opportunities to learn new skills as well enjoying the trip down the River Wye. You can also often see peregrine falcons, kingfishers and buzzards so relax and take in the full riot of nature that this river can offer. Canoeing is a great introduction to the River Wye and is suitable for complete novices or those of a delicate disposition (e.g. hung-over!) We can introduce you to team water polo and relay races if you want more action. If you have a party with non paddling members who would like to experience canoeing then we can tie the canoes together to form rafts so everyone can enjoy the day. So whether you want a lazy day canoeing down the River Wye or want to have a fun filled day with games and team events then canoeing is a great option. 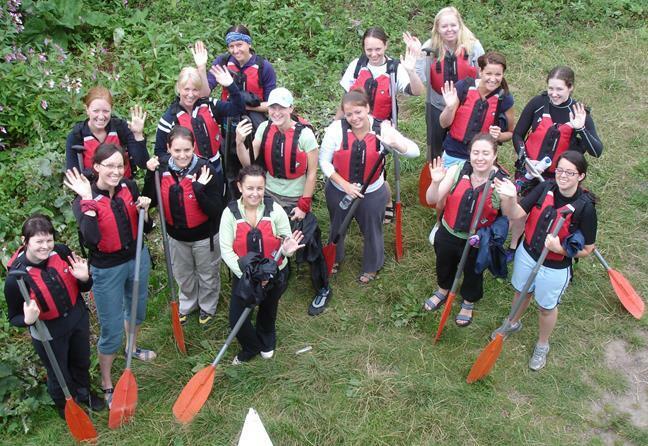 Our canoeing and kayaking sessions can also be tailored to suit any group, so whether you are searching for some corporate team building activities for your company, something fun and exciting for a group of friends to do, a watersports activity that all the family could engage in, or just want something to suit a Hen or Stag Party, then we can provide a canoeing and kayaking session just for you. 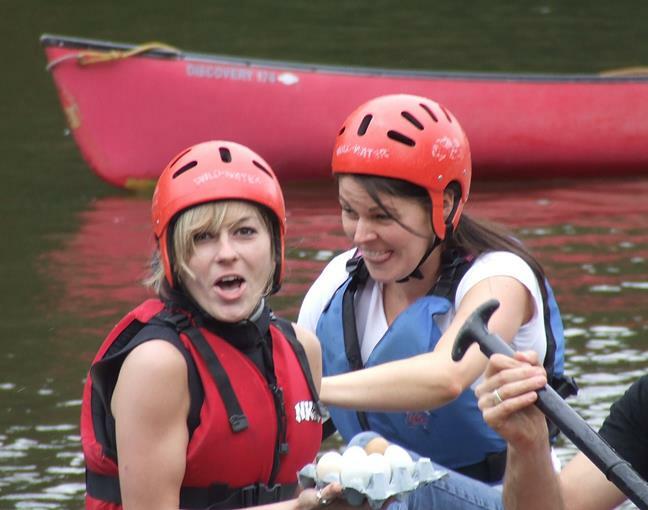 We can also incorporate other challenges within the canoeing and kayaking session if you want to include leadership and planning as a part of your team building process. 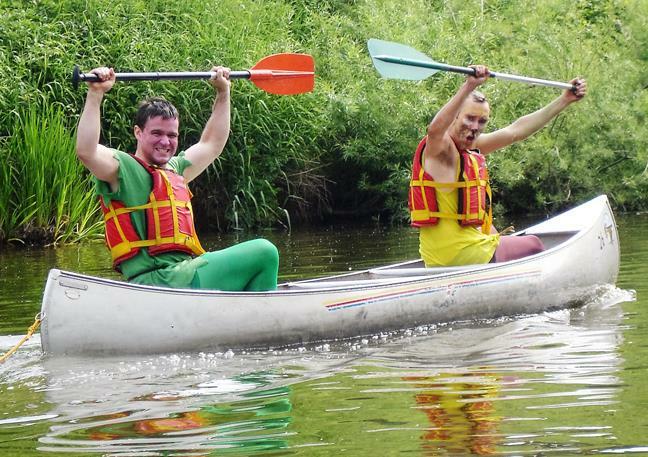 During the canoeing and kayaking session we will be taking photos and videos of you and your party. We will then send you all the pictures so that you can relive those moments again and again. If you want to bring your own cameras or go-pro's etc. you can do so but it will be entirely at your own risk. I organised a canoe trip for a group of six, for my partner's birthday. Michael was helpful and straightforward to work with, and sorting out the trip was straightforward. Near the day, the weather turned a little unpredictable. The canoe centre cancelled all bookings from the general public, but because Michael is an experienced canoeing instructor, they gave him the option to retain our booking. He consulted with us (helpfully giving us alternative activity options if we were fazed by the prospect of poor weather) but we decided to go ahead. This was a great decision, as we had the river almost to ourselves for the majority of the trip, and the weather really wasn't so bad. Although none of the party had canoed before, and we are a mixed-ability group, we made a 12-mile run from Kerne Bridge down to Monmouth, stopping at the Ferry Inn for lunch. 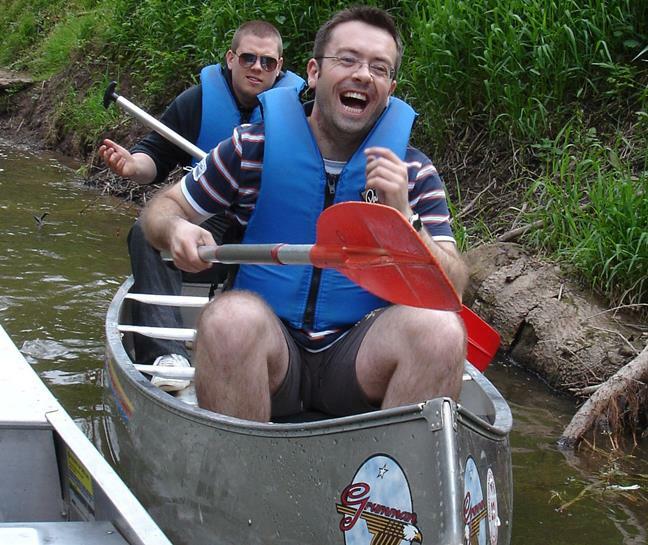 We negotiated rapids (fun, not scary, but we were not skilled!) and learned a raft (pun intended) of canoeing skills. Nobody fell-in, despite 40 Mph winds at some points. 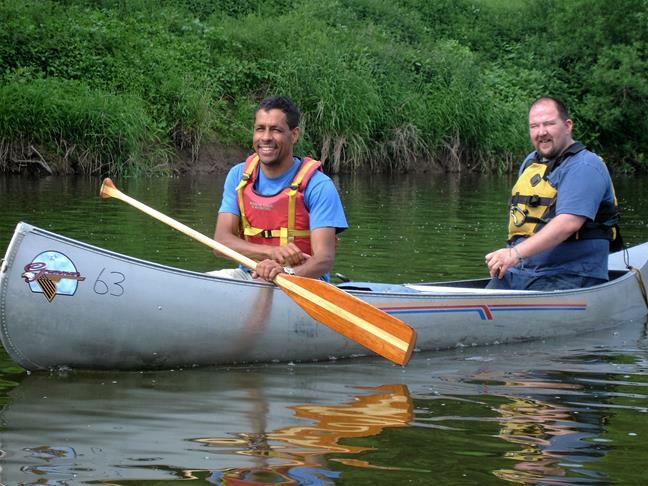 Michael is great company to have on the canoeing outing, as well as being very skilled and technically able so you feel very safe, and also a fount of knowledge about the river, its history and wildlife. It was a fantastic day out, one that we'll remember with pleasure for a long time. The birthday girl was absolutely over the moon with the day. It has also made several of us agree to try canoeing again in future, and hopefully also sample other activities that Michael's company has to offer. A massive thumbs up for the activity, the area, and the company. From the start Michael was a great help, helping me to arrange a day of activities and answering the numerous questions that I had along the way! He always came back to me quickly and worked up a full plan for the day. On the day Michael was very chipper and upbeat which was definitely needed given how we were feeling from the night before! We did canoeing and rock climbing and I would definitely recommend Michael if you're looking to do some activities in the Herefordshire area. Michael is an absolutely excellent guy. He provided us a superb weekend, bending over backwards to make our day work for us. We abseiled, gorge walked and canoed all in one day. We had 4 children between 10 and 12 years old and he was brilliant with them all, especially taking care of those that were a little more nervous. Thanks for an awesome day, we really enjoyed the canoeing especially getting through the rapids in one piece and the abseiling was great in the morning as well. I would thouroughly recomment going canoeing with this company.